Before a new season starts up, let's take a look back at one take on a villain's origin. How did Sombra become the king of pyrrhic victories? Check out the full review along with some old-school spoilers after the break! I'm going to assume that many of you are thinking, "Silver–you reflective roseate–why bother when this story is surely to be cast into the non-canon bin?" 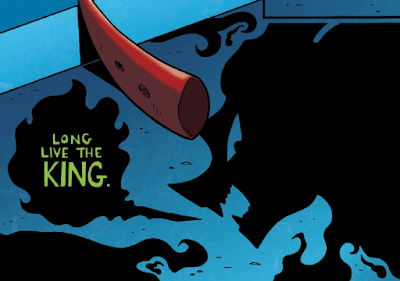 I'm betting you're right, but canon is not my concern here. I'm more interested in the story and a possible take on a poorly-defined character. Sombra is often a terror of the mind. 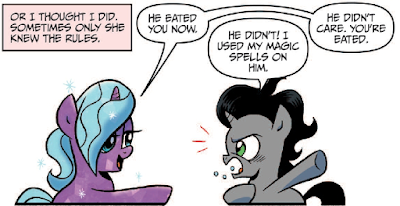 We hardly got a chance to see him in combat outside of "The Cutie Re-Mark" and yet his darkest spells were traps set to ensnare ponies like Twilight. 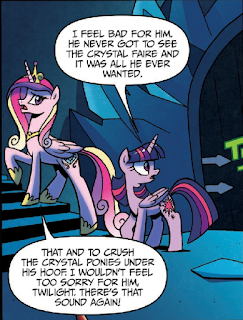 We saw the consequences in every crystal pony that couldn't recall their own history. Yet as a character we only know one descriptive, "[A] unicorn whose heart was black as night". all the lawyers in "Godzilla vs the Legal System"! 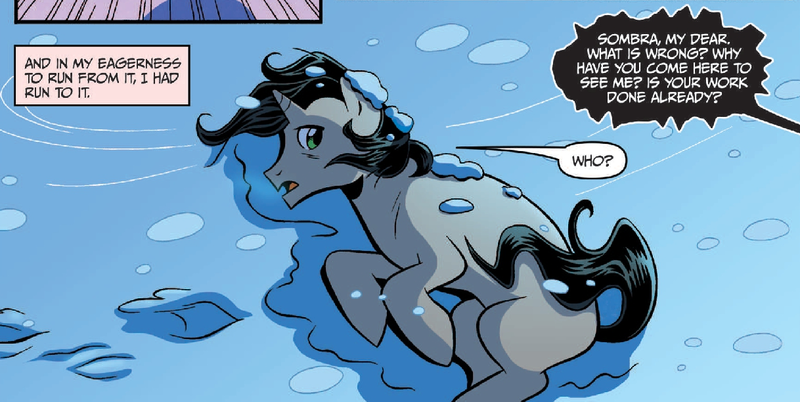 I remember when I first heard that I was curious how a pony could become this way. Was he simply born evil, as is the trapping of many children's story? I'm not a fan of a story in which someone is simply born good or evil, but this tale offers a twist. Thankfully, this story is augmented by some great visuals. Brenda Hickey renders the Crystal Empire and its inhabitants in faithful detail while adding new areas like Sombra's personal study. I notice that when setting the crystal ponies against a backdrop, they're often framed amongst grass or flooring. I think this is because the standard crystalline walls would visually swallow the ponies. 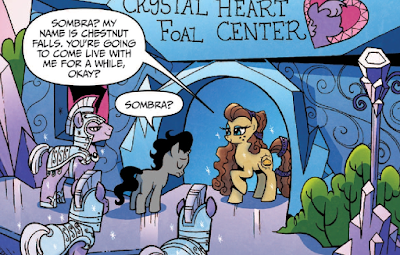 It's no surprise that additional characters like Chestnut Falls feature brighter coats that stand out amongst any crystal setting while Sombra's gray coat emphasizes his social disconnect. Welcome to Ms. Fall's Home for Gifted Ponies. Yet my favorite artwork is Princess Amore's design. She embodies the regality we associate with Celestia without relying on alicorn status to affirm her. The finery is hard to place but I get the sense it's inspired by Arabian harnesses. Add her warmer, peach-colored coat and golden eyes and I could see this as an actual design for the show. unicorn of all time? No. If I had I..."
One of the benefits of looking back at this comic is new information. At the time it came out, I had no idea it was setting the stage for "Siege of the Crystal Empire." Yet re-reading it now some things stand out. 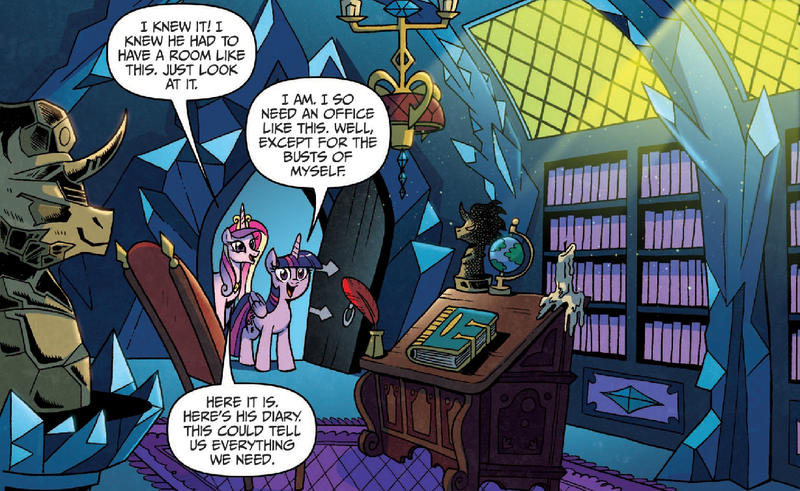 Case in point, as she follows Twilight into Sombra's hidden chambers, Cadance starts making assumptions. "He sure liked himself". Odd thing to assume, even if she turns out right about his diary. 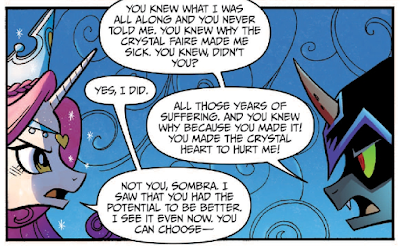 We'll learn later that Sombra is filled with self-doubt and possibly loathing. It may be that the busts where there to remind him of what he was supposed to be even if he did not feel it. Are you kidding? I'd want several busts of myself! The story of Sombra's childhood is a dark mirror to Cadance. 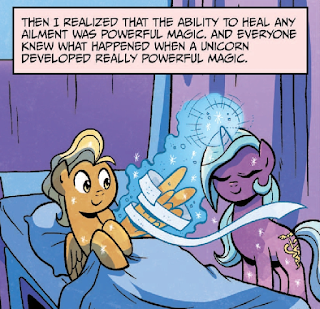 Those who read "Twilight Sparkle and the Crystal Heart Spell" will recall that Cadance was found an orphan pegasus who was raised by a small town, surrounded by love. Sombra was an orphan unicorn raised within the Crystal Empire but never accepted. His one friend being a quirky and imaginative filly named Radiant Hope. sharp opinions between fans down the road. 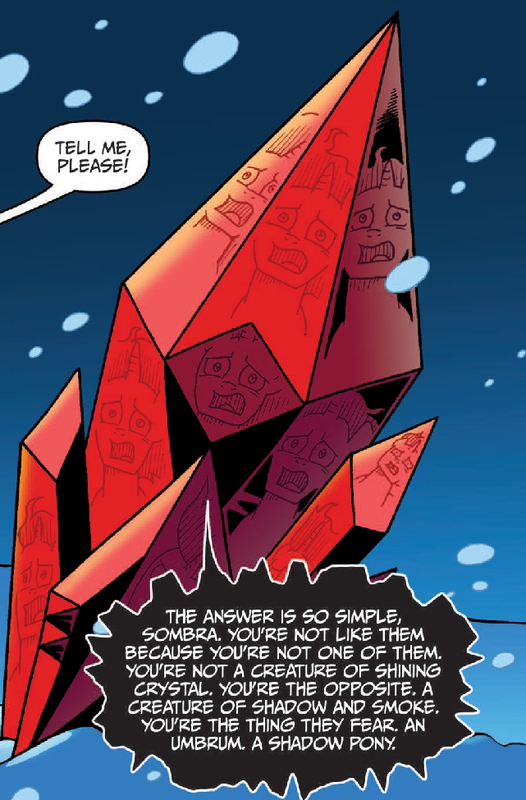 There is some dissonance in Sombra's recounting. It seems that the older mare Chestnut Falls really does care for him. She is visibly upset when he is unwell, relieved when he recovers, and spends time personally tutoring him. The only rejection he seems to suffer is the other children refuse to play with him. That's not to say he didn't experience rejection from adults, but that's an assumption rather than something we witness. Kids can be horribly cruel and so I'm torn. 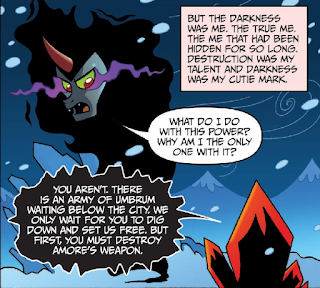 This could be an element missing from the story, or it could reflect Sombra's desire to see himself as a victim and thus justify his revenge. The true rejection we witness is on behalf of the Crystal Heart. 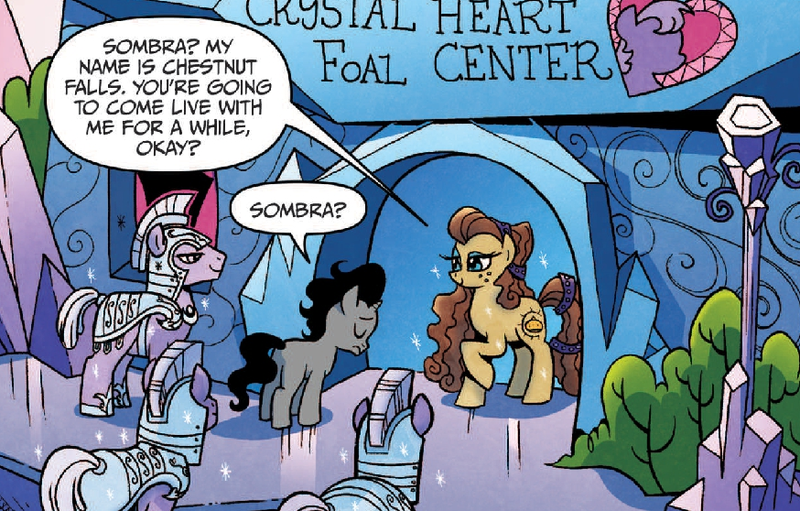 Each Crystal Faire sees Sombra sickly, immobile, and nearly dead. This sets the stage for the larger theme of destiny and how Sombra highlights the uncomfortable aspect. Why did Amore never send him beyond the Heart's reach? 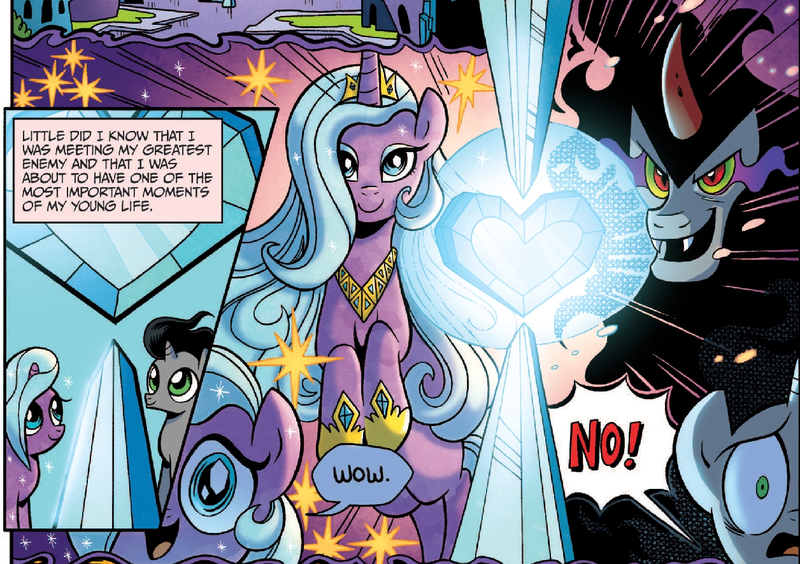 When they looked into the Crystal Heart, Sombra and Hope saw polar opposite destinies. Hope is very much a parallel to Twilight. She hasn't the same learned style, but she is socially awkward and possessing powerful magic. She becomes more accepted as she begins to put that power towards service and her destiny seems overall pleasant. I doubt she would protest this future. Ain't destiny a fickle mistress? 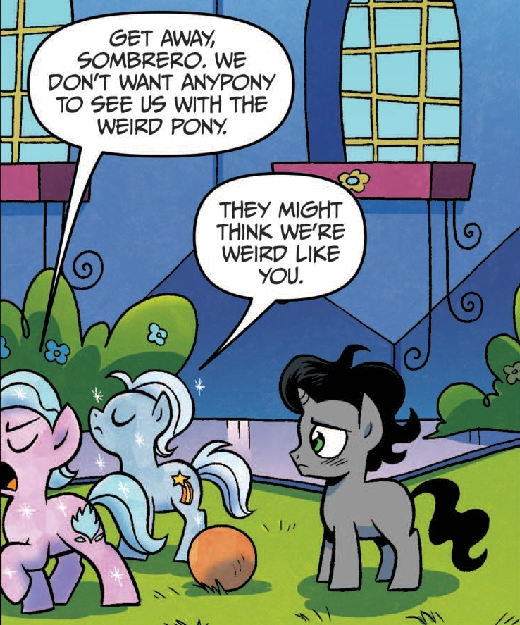 Yet what does that mean for Sombra? Do we only accept destiny when it benefits us? If destiny is a surety, then Equestria's villains are as much fulfilling the grand design as its heroes. Yet this isn't a future Sombra wants. Reminiscent of The Appointment in Samarra, Sombra flees from the Empire once he realizes that if Hope's destiny is being fulfilled, so will his. Just so, he runs into the entrapped Umbrum, who present him with a choice. The choice is his life against a city that rejected him. 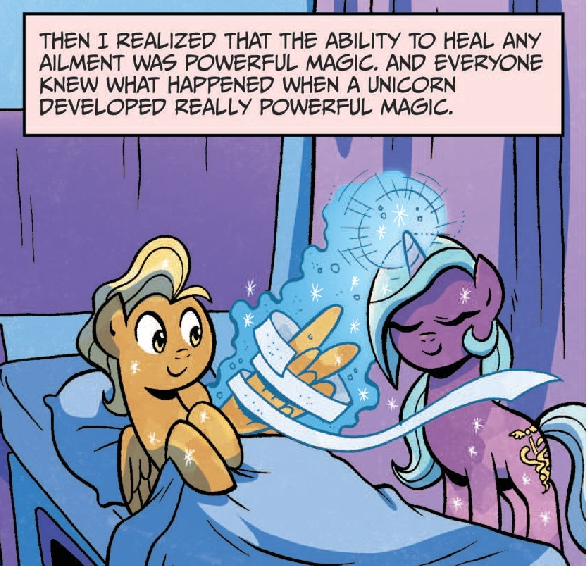 Princess Amore asserted that ponies could change their future, which is a bold claim given Equestria's reliance on fate and destiny. 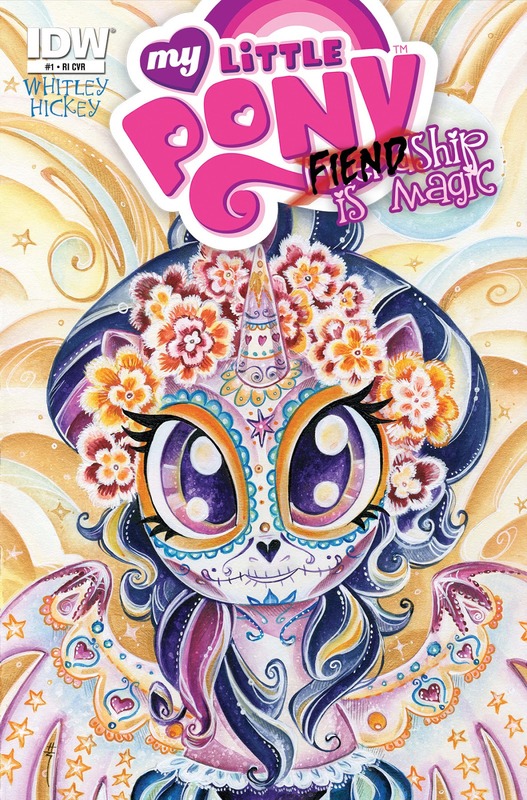 Cutie Marks, birthrights, and even magical artifacts herald your role in this culture. The ponies place too much trust in this fate, and so they rarely challenge the grand design because usually it works to their benefit. How then could Sombra not fear that dark prophecy? if he'd fled to the left! The Umbrum present him with either stealing the Crystal Heart or dying at the next Crystal Faire. I imagine that this isn't the choice Amore would have offered, but she made a critical error. I have suspicions on why she never approached Sombra during those painful times. Perhaps she was afraid of him. Or she was blinded by her Empire's beauty and assumed he would support them. Maybe she feared her own assertion was false and this was a last-minute attempt against destiny? Better than what? You never gave him an example to follow! 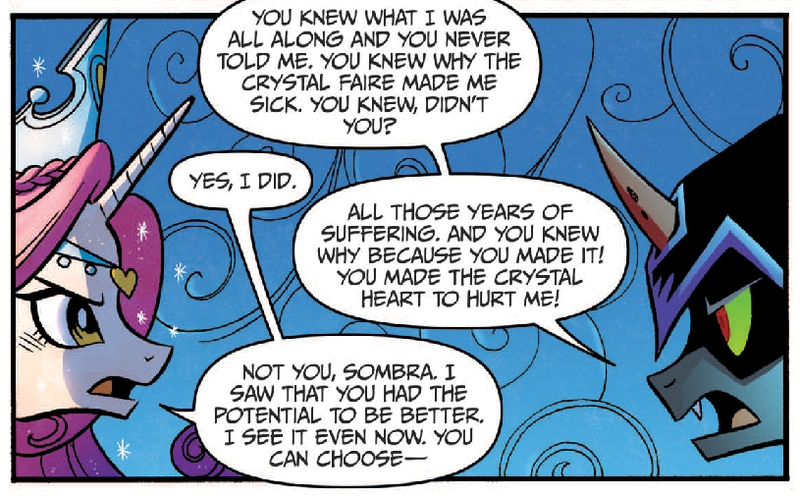 Whatever the case, Amore lost Sombra the moment someone else framed the choice. Of course he wouldn't give his life for a land that he felt rejected him. Amore's admission that she knew all this time only deepens his resentment and seals her fate. This presents a strange example of mandates. A tweet by Jeremy Whitley states that Hasbro required a caption stating that the shattered Amore was not dead. It's a little late to ask that question. This comic is plenty dark on its own, but I think Hasbro actually made it darker. 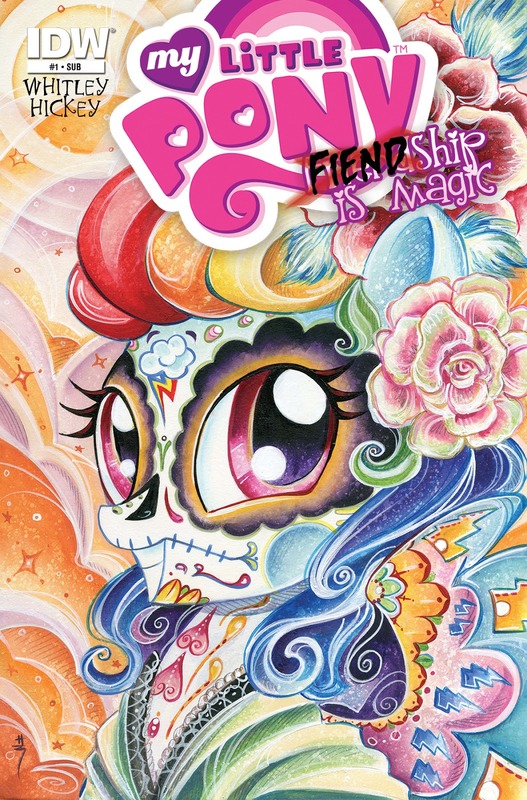 I get that death is something we don't expect from My Little Pony, but consider what they've created. Amore is in a state between life and death for over a thousand years. The only way that could be more horrifying is if she were somehow conscious during this fragmenting. In trying to keep this "kid-friendly", Hasbro went and made it way more uncomfortable. We never did find out if she was truly related to Cadance. Sombra's taunt as he breaks Amore is interesting. A taunt is not a sign of strength, so even as he claims that he's no longer afraid of the ponies who tormented him I wonder if he's still trying to bluster his way through. 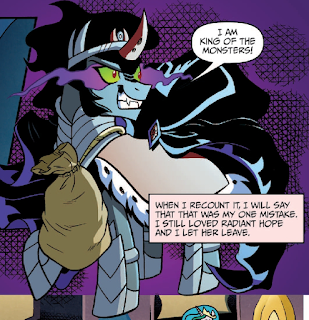 Sombra has decided he is the monster they feared, and he wants to delight in it. Yet there's a note that all this is an act. He's trying to be what he thinks his destiny means. As the story ends on a tragic note (setting the stage for a four-part followup), we get polar reactions from the princesses. 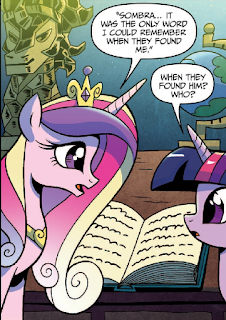 Though Twilight expresses a note of sympathy, Cadance seems unmoved. To her, Sombra is still the "bad guy". 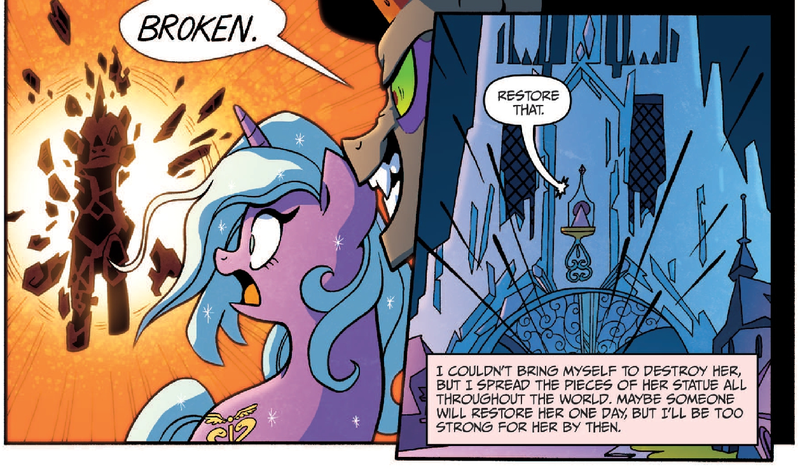 There's a note of tragedy as this is the same mentality that left Sombra isolated. Perhaps she doesn't want to admit what this story means. is in heavy denial about what she just read. 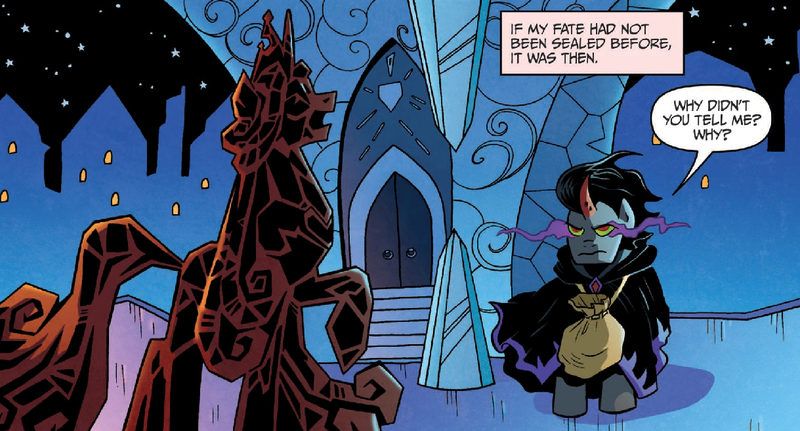 Sombra's fall draws attention to the darker side of believing in destiny, and that the Crystal Empire isn't the pure, loving realm they'd like to believe. You are welcome and beloved as long as you meet their criteria. 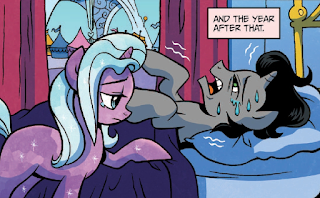 I think this expression would have had a greater impact if we had seen some adult ponies react to Sombra. Show that the rejection is not limited to the schoolyard. I can see a lot of foals having this discussion. However, this comic also shows how perspectives can shift. 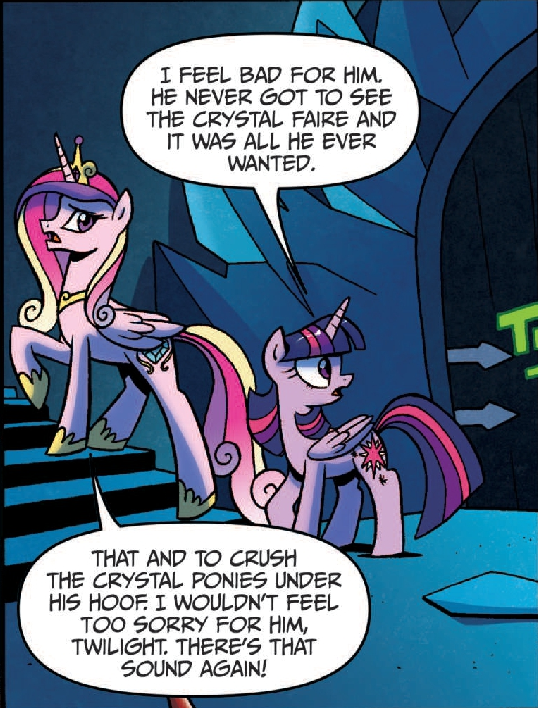 Twilight's anger during "Siege" removed any sense of empathy, while Cadance at least managed to reach Radiant Hope by actually treating her as a thinking–albeit naive–pony. Change without a goal can lead to chaos. 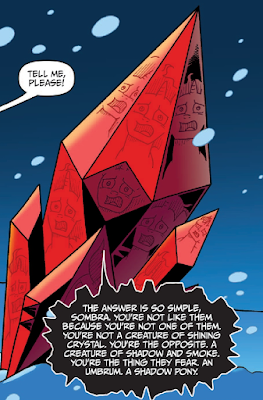 Amore's greatest mistake was not providing Sombra with a beacon. I also wish we could know more about Amore. It's still dark to think that her fate will never truly be resolved. They only accepted Hope once she served a utility. 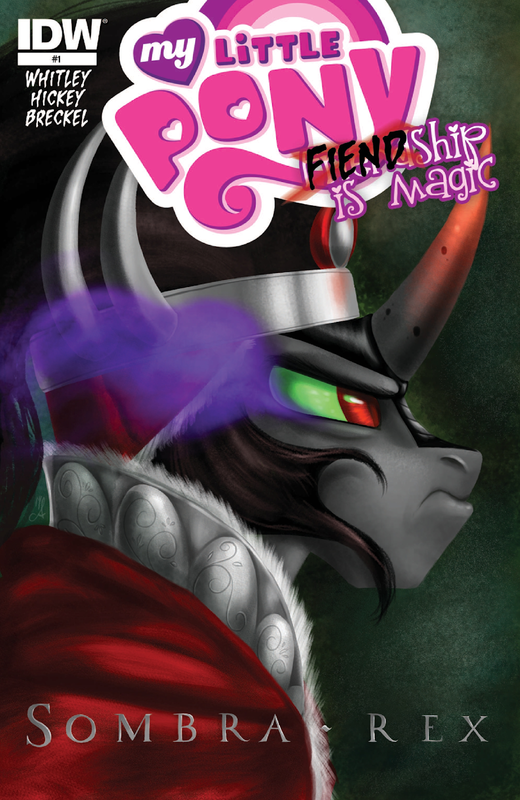 This issue is my favorite of the Fiendship is Magic line due to the risks it takes, the darker themes, and the fact that it fleshed out a character of whom we knew little. To me, it doesn't matter if it aligns with the show several years later. It's still a good read. Please, no spoilers in the comments! I'm Silver Quill. Thanks for reading!